Last weekend was our 28th wedding anniversary so we decided to fill the entire two days with some special events. Saturday we drove up to Rüdesheim am Rhein, one our favorite spots in Germany. After we ferried across the Rhine River, always an enjoyable event, we parked and walked up Rüdesheim’s famous Drosselgasse. After an amber nectar and a meat and cheese plate we drove on into Wiesbaden. We started the day in one of the wine/beer gardens on the Rüdesheim Drosselgasse. Perfect!! On the first weekend of June Wiesbaden hosts the Wilhelmstaßefest. The first and last time we attended this fest was in 1988 so we were excited to see how the fest had changed and grown. Wiesbaden is already a very pretty city and the fest was just as wonderful as we remembered but had grown significantly. We met some friends and their two kids which made the day quite fun. Wilhelmstraße is Wiesbaden’s high-end shopping street. Just off Wilhelmstraße is this souvenir store who’s building front consists of the world’s largest cuckoo clock. When we first attended the Wilhelmstraßefest in 1988 the fest was pretty much limited to the street and sidewalk. Now the fest has grown into the city parks along Wilhelmstraße which has almost doubled the festival size. This fountain and green area is front of the city casino. As mentioned, Wilhelmstraße is a high-end shopping street in a very wealthy city and the festival reflects that opulence. This isn’t just a beer and wine festival, most of the drink vendors sold various forms of Sekt (champaign). Here’s the perfect illustration of the upscale nature of the fest, candelabras at a typical drink vendor. Even the beers at the Wilhelmstraßefest are somewhat upscale; Weihenstephaner and Andechs. Here’s a beer not normally found at a German festival, Staropremen, a fine Czech beer. There’s usually some fun, special sights at one of these big festivals. Here’s some type of vendor on his mobile cart, playing a favorite German festival song. One of our favorite foods at these festivals, the winzersteak, a pork steak sandwich with fried onions. Also, a couple of fine beers, Weihenstephaner Original. These folks were dressed as hooded trolls and wore these springed stilts which gave them an even more eerie appearance. Germans like to scare the crap out of their kids at some of these festivals. Here’s a strange glowing champaign kind of drink we found. It’s even more iridescent than my hair. Another example of globalization, a Wiesbaden bus. Sunday morning we drove about an hour from Wiesbaden north to Burg Eltz, about 20 miles southwest of Koblenz. This is an interesting castle because it’s still privately owned by the family that has owned it for 33 generations. Back in the day when lesser nobilities did not have enough power or money to build their own castle, sometimes a number of these types of families would join together to share the cost of building and defending a castle. These castles were called Ganerbenburg and Burg Eltz is just such a castle. Three branches of the family that occupied the castle in the 12th century built their individual sections of the castle, Rübenach in 1472, Rodendorf between 1490 to 1540 and the Kempernich family in 1530. Today, only the Rübenach and Rodendorf parts of the castle are open to the public. 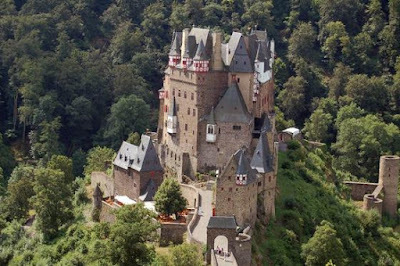 Strangely, Burg Eltz, is built at the bottom of a very steep valley which would seem to create defense problems. It certainly made for walk-in and walk-out issues. Here’s a picture of Burg Eltz we found on the Internet. This was the image that we expected to see upon our arrival. This is the condition we actually found the castle. This scaffolding was also inside the castle, there for roof repairs. Regardless, there was a very nice 40 minute tour through the castle, in English, and access to the castle treasury to see, well, their treasures. This is kind of a cute ticket booth on the way out of the parking area at Burg Eltz. Of course, it’s always a little chuckle to see Gute Fahrt (Have a good drive). Our next event on Sunday was the Pottery Festival in Höhr-Grenzhausen, a town less than ten miles northeast of Koblenz. Each year on the first weekend of June Höhr-Grenzhausen operates this festival, which, as the name states, has a central theme of pottery. The town has a ceramics college and a ceramics museum. Even the city crest consists of three clay pots. 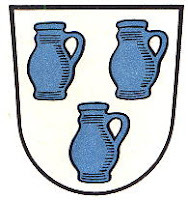 Not surprisingly, the town is nicknamed Kannenbäckerstadt (Jug Baking City). The number of artisans, pottery vendors and craftsmen was actually quite large. There were all sorts of styles, colors and pottery techniques. Here are just a few images of the vendors at the Höhr-Grenzhausen Pottery Fest. Fohr!!! That’s the kind of beer we found served at a gasthaus in Höhr-Grenzhausen; Fohr Pils. Surprisingly, the Pottery Fest did not include much in the way of beer or wine, just pottery. Go figure! A jug, a pitcher, a bowl, a Vikings helmet and a little mouse was our take from the Pottery Festival. Just an hour and fifteen minute drive home and the end of a great 28th Anniversary weekend!! Wow, what a great anniversary trip! I like the drink that matches your hair mom. The castle is so beautiful, too bad you didn't see all of it though. The pottery festival looks really cool too...of course Daddy got a Vikings helmet. Great blog! Love and miss you both!